I speak for the entire team at Rondo Pools and Spas by saying how much we appreciate you giving us the opportunity to work with you and your family on your new backyard pool project. We know that you have many choices when choosing a company to help design and build your dream pool which is why we are honored that you’ve given us the chance to show you why we have become the valley’s premier custom pool and spa specialist. As you begin to plan and design your new backyard oasis, you will soon find that design concepts and features are almost limitless. It is the goal of our talented design team to not only find out what appeals to you visually, but also learn how you and your family will most enjoy using your new backyard environment. We will take your vision and combine it with our knowledge and experience, to design a pool and backyard environment that is both beautiful and functional. While it’s usually our designer’s skill and the relationships they foster that earn our new clients trust, it’s our entire team’s hard work and dedication to deliver a superior pool and experience that has earned Rondo Pools and Spas’ their prestigious reputation. Over the past three decades, Rondo Pools and Spas’ has perfected the process of building pools. From our detail-oriented planning and processing department to our streamlined construction schedules, we have worked to improve every aspect of the pool building process. This precision, along with how we care for and communicate with our clients, has have helped us earn the appreciation of more than 10,000 valley families. We look forward to doing the same for you and your family. Whether you’re looking to build a grand resort-style pool or a simple play pool, let us help you transform your backyard into the one you’ve always dreamed about. There is no better way to escape the hot Arizona summer than by having your own backyard oasis. Let Rondo Pools help you build a pool that is perfect for your home, lifestyle, and family. Rondo Pools is proud to be a trusted partner to many of the valley’s most prominent multi-family home builders. 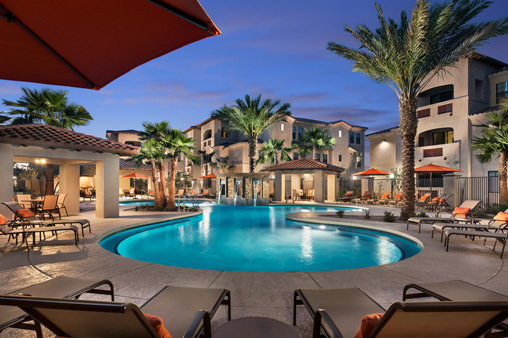 Through these relationships, Rondo has built more than 1,000 pools for the valley’s finest Apartment Homes, Condominiums, Resorts, and Community Associations over the past three decades. Swimming pool designs, materials, and technology are constantly progressing and evolving. At the same time, so is our tastes and design style. If you have an older pool that you want to give new life, let Rondo Pools help make that old outdated pool the centerpiece of your backyard again. How do you envision your Dream Pool? Shopping for a pool builder can be nerve-wracking, a perspective buyer will quickly discover that not all builders are created equal. From the larger production companies to the small independent owner/operators… from the discount builders to the boutique luxury builders, the number of options is vast and deciding whom you should work with can be intimidating. 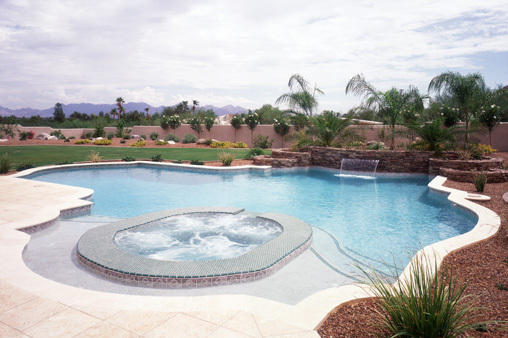 Rondo Pools is one of the oldest family-owned and operated pool companies in Arizona. We are very proud that we are in our fourth decade of operation and second generation of Rondeau family ownership. This longevity is a testament to our reliability and financial stability. When deciding on such a valuable investment to your home, you need to make sure that the company you choose will not only deliver the highest quality product, but will be there to service you for the life of your pool. For years, our motto was “Big enough to combine quality and value, small enough to care for every customer.” That message still embodies the values that we hold dear. While Rondo Pools continues to be one of the valley’s top builders, we have purposefully maintained our company size and market share to enable us to provide what others cannot. While the valley’s largest companies strive to build 1,000+ pools a year, Rondo chooses to build 200-300 projects so we can deliver a level of supervision and customer care that is unmatched. 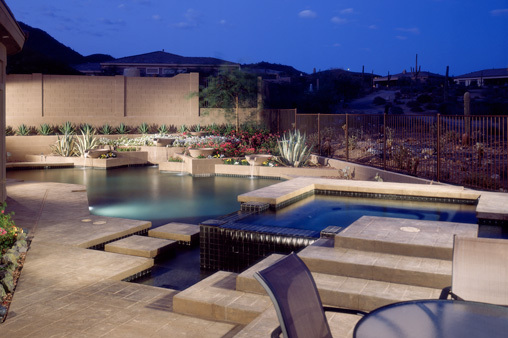 Many of the valley builder’s will use basic “template” pool shapes and call them “Custom” pool designs. Our design team prides themselves on being innovative, designing new and unique pool concepts that enhance your home and backyard. We use the latest in 3D technology to allow you to see your pool from every angle. With our design software, you’ll be able to see the finished project before we even put the first shovel in the ground. With all products, there are high quality options as well as cheaper alternatives. In all cases, there are compromises to the quality that must be made to allow the lower priced alternative. Since 1983, Rondo Pools has been committed to using the industry’s highest quality and most reliable products and materials. We’ve learned that while these compromises may provide a cost savings, they too often lead to reduction in overall value. At Rondo Pools and Spas, we pride ourselves on providing both quality and value. Rondo’s commitment to customer care is unparalleled. We have learned that consistent and accurate communication is a key factor in keeping our clients happy throughout the process. To achieve this high level of communication for all of our clients, we have incorporated “Customer Care Representatives” into our team. With the help of these representatives, we aim to keep you well informed from the first day to the last and every day in between. Simply tell us your design requirements and one of our design consultants will contact you with a quote shortly. We recently purchased a pool from Rondo. We looked at a few companies and were the most impressed with Rondo and designer Raphy. He really impressed us with his design and presentation. The build went smoothly even with all the rain we received in the area. They even were able to work around the landscaping work that was being done in the backyard. Our Customer Care Rep was always quick to respond to any question we had. We have a house in a new housing development and the new home counselor has even sent prospective buyers over to look at our new pool. We would definitely recommend Rondo to anyone looking for a pool. I wish to take this opportunity to express my thanks and appreciation for the way your organization and especially my project foreman, Mr. David Furman, ran and completed our pool project. Ever since moving to Arizona, I have been attracted to the Rondo Pool business. I guess because it is a family business and I favor that type of attention to detail. So, when my wife and I decided to refurbish our pool, Rondo Pools was our first choice. From the very onset, Dave Furman gave us his undivided and professional attention. The costs and amenities available were presented at a most professional level. As I am very interested in the details of the construction process, i.e. how this is done, how that is located, etc., I must have been at times a total pain in the neck to Dave and his crews. But, they always allowed me to ask questions and gave detailed answers without complaining. I appreciated that. All of the subcontractors were very skilled. They arrived as scheduled, completed the job in a timely fashion and left the premises clean. Again thanks to you, your organization and Dave for a very good experience and a beautiful pool. We are enjoying it very much. We were very pleased with the pool put in by Rondo Pools. From the very beginning, our experience with our salesman/designer Bryan was excellent. We had other pool companies come out for estimates and ideas, but the design and the price given to us by Rondo was the best. Bryan had excellent ideas for the design of our pool and deck. The work started when they promised, and we were kept up to date with the progress of the pool. They told us a date to expect to be swimming, and sure enough we were actually swimming before that promised date. The construction team and our project superintendent Pete were very professional and always showed up when they said they would. If we ever had questions, a call to Pete was always returned in a timely manner. Also, as much as can be expected with such a project, they always cleaned up as much as possible after each visit to our backyard. Overall a very good experience, We would recommend that anyone looking to put in a pool should definitely consider Rondo Pools. We love our Rondo pool. From the day we entered the showroom we felt instant confidence in selecting Rondo as our pool builder. Our salesman listened to our desires, me liking the square designs and hubby liking curved lines, offers up a challenge yet we were provided a design we both loved with some added features we had not even considered. There was never any pressure to make a decision and he readily made modifications until we were satisfied. Having built pools in previous homes we were ready for delays but Rondo kept constant communication with us throughout the entire construction. We knew who would be coming and when and the pool was completed in 5 weeks. The quality of the pool was top notch. Even one of the inspectors remarked on the quality workmanship compared to other pool builders. We agree! Rondo builds an affordable quality pool and we have readily referred friends and neighbors to be sure to check out Rondo if they are looking for a pool. Thank you once again for the hard work your whole team put forth to transform our backyard into the retreat we envisioned! From our very first meeting with your sales designer, the design process was a pleasure and the attention to details and our goals well understood. Your superintendent kept the entire process moving forward and was always available to answer any questions when needed. We felt very informed during the building process and thrilled the project completed on time. Our home is now complete with a gorgeous Rondo backyard including pool, spa, water features, fire-pit and travertine decking... and we are loving it! We had a great experience with Rondo. The pool is wonderful; everyone was super courteous and helpful. Especially our Customer Care Rep who I emailed quite often; she was amazing, helpful, and super informative. She made the experience even better and walked us through each step of the process, even when we were annoying. I hope she get recognized for her efforts and great customer service. We just completed our pool remodel with Dave Furman at Rondo Pools. I got estimates from 5 major pool builders in the valley before deciding on Rondo. We love our new pool! This was an average dollar project at $15k but we never felt our small job was less important than a big high dollar one. More importantly the process was the easiest remodel project (new kitchen, floors; doors in a year) I've done to date on our home. I'm sure this is thanks to Dave and keeping the project on track. This is our seasonal home and I was concerned about monitoring this project from Chicago but it turned out quite easy to accomplish with Dave in constant contact with me and updates. I'd recommend Rondo pools to my friends. Good Investment, Great Company! – Thanks to Rondo our pool and backyard landscape is gorgeous! We can't say enough about the wonderful people at Rondo who created our sanctuary. They were prompt and communicated with us throughout the process, addressing all concerns during and after construction. All work was done skillfully and with care to keep the area relatively clean throughout the construction. This is truly a company with integrity. Just wanted to take a moment to say how happy we are with our new Rondo pool. From the initial design to the final completion, every inch of the way was professional. The workers sent to do the job were excellent, caring about their work ethics and most importantly friendly and respective of the property. Any unforeseen complications were handled without any cause for delay and thus the pool is outstanding. Once again…Thanks! Very Satisfied Customer – We had a new pool and spa built by Rondo pools this spring. From the very beginning we were treated with professionalism, friendliness and caring for what our dream pool should be. Any concerns we had both during the construction and afterwards were immediately looked after with the same professionalism we received from the very beginning. We love the pool and spa. It turned out better than we envisioned. If you want a first class job done by a first class company you are at the right place with Rondo pools. We highly recommend the great company. We purchased a lot to build a new home, and even before ground breaking we contacted three pool builders in the Phoenix are to give us some ideas and an estimate. Rondo was the only company that offered to meet us at the property to discuss this with us. The sales rep was knowledgeable, and he was excited. We discussed our needs and he gave us some options/opinions. Two days later we had a 3D pool plan that we just loved. We never looked back from that point. What a great company to work with, from the first time we met at our lot to the day Rondo did my new pool orientation. Seldom am I completely satisfied with the product, and the customer service of a company. During the process we had the pleasure of working the CEO of the company, which isn't all that common in business today! I would highly recommend Rondo pools to anyone considering building a pool. Ours is a "spool", and I have no doubt we were treated the same as any customer building a pool 3 times the size of ours. Ask for Pete to be your construction supervisor; GREAT COMPANY! I wanted to share my experience dealing with Rondo Pools. My wife and I have looked at several large and small pool builders and Rondo Pools came up with a design we dreamed of. Your entire team provided us with excellent customer service and Kudo's goes to Raphy (Avakian) for all his hard work with the pool design. The 3D program Raphy used was an excellent tool to give us a vision of what the pool would look like. I have recommended Rondo Pools to my family, friends and neighbors.